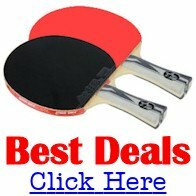 These were the original laws of table tennis which were agreed in 1926. However, you'll notice that they changed very little in the subsequent 90 years. You can read the current laws here. 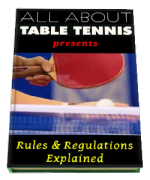 This new book explains SIMPLY and CLEARLY everything you need to know about the rules and regulations of table tennis. The table shall be in surface rectangular, 9ft in length, 5ft in width; it shall be supported in such a way that its upper surface shall be 2ft 6ins above the floor, and shall lie in a horizontal plane. It shall be made of solid hard 1in wood, or shall yield a uniform bounce of not less than 8ins and not more than 10ins when a standard ball is dropped from a height of 12ins above its surface. The upper surface of the table shall be termed the "playing surface"; it shall be non-reflecting, of a dark colour with a white line, 3/4in broad, along each edge. The lines at the 5ft edges or ends of the playing surface shall be termed "end lines". The lines at the 9ft edges or sides of the playing surface shall be termed "side lines". The playing surface shall be divided into two courts of equal size by a net running parallel to the end lines and 4ft 6ins from each. The net shall be 6ft in length; its upper part along its whole length shall be 6 3/4ins above the playing surface; its lower part along its whole length shall be close to the playing surface. The net shall be attached at each end to an upright post 6 3/4ins high; the outside limits of each post shall be 6ins outside the side line on the same side. The ball shall be spherical. It shall be made of celluloid, pale in colour; it shall not be less than 4 1/2ins nor more than 4 3/4ins in circumference; it shall not be less than 2/27ozs nor more than 2/25ozs in weight. The racket may be any material, size, shape or weight. A game shall be won by the player who first wins 21 points, unless both players have won 20 points, when the winner of the game shall be he who first wins two points more than his opponent. The choice of ends and the right to be server or striker-out in every game shall be decided by toss, provided that if the winner of the toss choose the right to be server or striker-out, the other player shall have the choice of ends, and vice versa, and that the winner of the toss may, if he prefer it, require the other player to make the first choice. After five points the striker-out shall become the server and the server shall become the striker-out, and so on after every five points until the end of the game or the score 20-all. At the score 20-all the striker-out shall become the server and the server shall become the striker-out, and so on after each point until the end of the game. The player who served first in a game shall be striker-out first in the immediately subsequent game, and so on until the end of the match. The player who started at one end in a game shall start at the other in the immediately subsequent game, and so on until the end of the match. Where the match consists of only one game or, where it consists of more than one game, in the deciding game of the match, the players shall change ends after 10 points, and so on until the end of the game or the score 20-all. At the score 20-all in such a game, the players shall change ends. The server shall first make a good service, the striker-out shall then make a good return and thereafter server and striker-out shall each alternately make a good return. The service shall be delivered by the server projecting or dropping the ball by hand into the air. The ball shall then be struck so that it touch first the server's court and then, passing directly over or around the net, touch the striker-out's court. At the moment of the impact of the racket on the ball in service, both shall be behind the end line of the server's court and between an imaginary continuation of the side lines. A ball having been served or returned in play shall be struck so that it pass directly over or around the net and touch directly the opponent's court. (d) if either player lose the point, as provided in Law 12(c), (d), (e) or Law 13, owing to an accident not within his control. (e) if his free hand touch the playing surface while the ball is in play. (b) if at any time he volley the ball. (f) it has touched any object other than the net supports, or those referred to above. The period during which the ball is in play shall be termed a "rest". A rest the result of which is scored shall be termed a "point". A rest the result of which is not scored shall be termed a "let". The player who first strikes the ball during a rest shall be termed the "server". The player who next strikes the ball during a rest shall be termed the "striker-out". If the ball, in passing over or around the net, touch it or its supports it shall, nevertheless, be considered to have passed directly, except as referred to in Law 11(a). If the ball in play come into contact with the racket or the racket hand, not yet having touched the playing surface on one side of the net since last being struck on the other side, it shall be said to have been "volleyed". The "racket hand" is the hand carrying the racket; the "free hand" is the hand not carrying the racket. The above Laws shall apply in the doubles game except as below. The surface of the table shall be divided into two parts by a white line, 1/2in broad, running parallel to the side lines and distant from each of them 2ft 5in. This line shall be termed the "service line". The part of the table surface on the nearer side of the net and the right of the service line in respect to the server shall be called the server's right "half-court", that on the left in respect to him the server's left half-court. The part of the table surface on the farther side of the net, and the left of the service line with respect to the server, shall be called the striker-out's right half-court, that on the right in respect to the server the striker-out's left half-court. The service shall be delivered as otherwise provided in Law 9, and so that it touch first the server's right half-court or the centre line on his side of the table and then, passing directly over or around the net, touch the striker-out's right half-court or the centre line on his side of the net. The pair who have the right to serve first in any game shall decide which partner shall do so and the opposing pair shall then decide similarly which shall first be striker-out. The first five services shall be delivered by the selected partner of the pair who have won the right to do so and shall be received by the selected partner of the receiving pair. The second five services shall be delivered by the striker-out of the first five services and received by the partner of the server of the first five services. The third five services shall be delivered by the partner of the server of the first five services and received by the partner of the striker-out of the first five services. The fourth five services shall be delivered by the partner of the striker-out of the first five services and received by the server of the first five services. The fifth five services shall be delivered as the first five services. And so on, in sequence, until the end of the game or the score 20-all, when the sequence of serving and striking-out shall be uninterrupted, but each player shall serve only one service in turn until the end of the game. In a one-game match, or in the deciding game of a match of more than one game, the pair that served the first five services shall have the right to alter their order of striking-out at the score 10 if that concludes a group of five services or at the conclusion, otherwise, of the group of services soonest concluded thereafter. The server shall first make a good service, the striker-out shall then make a good return, the partner of the server shall then make a good return, the partner of the striker-out shall then make a good return, and thereafter each player alternately in that sequence shall make a good return. If a player serve out of his turn, the player who ought to have served shall serve as soon as the mistake is discovered, unless a group of five services shall have been completed before such discovery, when the service in the subsequent groups shall continue in the same order, as if the sequence had not been discontinuous. In any circumstances, all points scored before the discovery shall be reckoned. If a player act as striker-out out of his turn, the player who ought to have been striker-out shall be striker-out as soon as the mistake is discovered, unless a group of five services shall have been completed before the discovery, when the order of striking-out shall continue in the subsequent group of services as if the sequence had not been discontinuous. Law 6: Alter "server", "striker-out", "winner", "he" to their respective plurals; alter "player" to "pair". Law 11(b): Insert "or his partner" after "striker-out"; "the striker-out" instead of the first "he". Law 11(c): Insert "any" in place of "either". Law 11(d): Insert "pair" in place of "player"; "their" in place of "his". Law 12: Insert "pair" in place of "player". Law 12(a) Insert "the server" in place of "he". Law 12(b): Insert "one of their opponents in proper sequence" in place of "his opponent"; "they" in place of "he". Law 12(c): Insert "either partner" in place of the first "he". Law 12(d): Insert "either partner" in place of the first "he". Law 12(e): Insert "of either partner" after "hand" and delete "his". Law 13: Insert "pair" instead of "player"; "their" in place of the first "his"; "one of their opponents in proper sequence" instead of "his opponent"; "either partner" instead of "him". Law 14(c): Insert "any" in place of "either"; add "or by any player out of proper sequence except as provided in Law 23". Law 14(d): Insert "any" in place of "either". Add Law 14(g): In service it has touched the server's left half-court or the striker-out's left half-court.